Editor’s notes aside, I should be scolded! And not for my lack of comma usage. Words are the easiest part and I need to get some dang words added to those drafts. One day. One day, or not, but hopefully one day, I’ll easily be able to make time to blog regularly again. But until then, I’ll randomly happen upon a draft every few months and throw a little something out in the blogosphere. Or I’ll type a bunch of spastic thoughts in my iPhone Notes and post it (like I’ve done quite a few times amidst the most “recent” blog posts). I’m going to post the “base” recipe, but depending on your needs you can add extra things to it. And let me tell you, don’t be scared of the green! This smoothie literally tastes like a peanut banana smoothie. My friend Lindsey introduced me to a version of this and I’ve been hooked since. 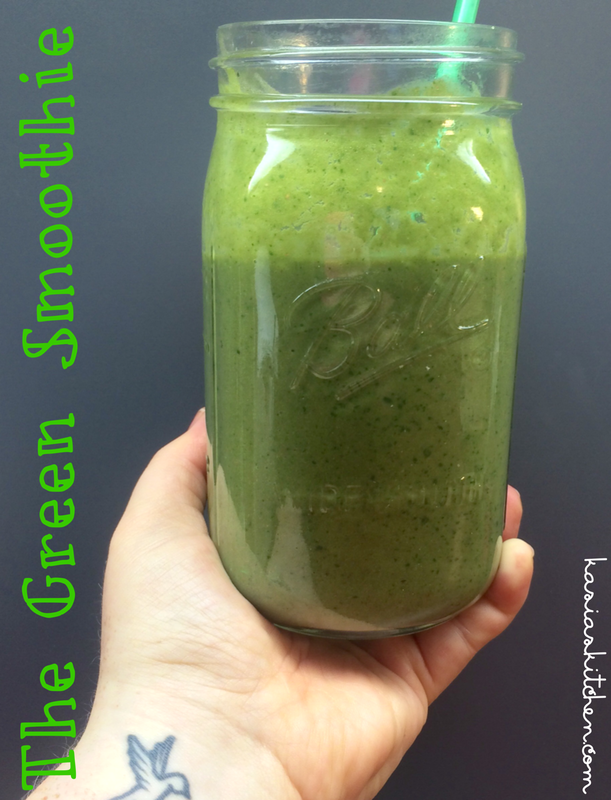 The spinach is tasteless in this and just adds extra needed nutrients! Lately I’ve been adding protein powder (just basic vanilla whey protein). I started working out again and noticed I wasn’t meeting the protein goals My Fitness Pal sets for me. I looked back at old logs and notice I rarely meet my protein goals! So I decided it was time to supplement. I add two scoops for an extra 90 calories and 15 extra grams of protein (I use this one). Previously I added a tablespoon of chia seeds. So like I said, depending on your needs you can tweak this how ever you need to! Easy! Add all ingredients randomly or in listed order and blend. For my cheap Black Friday deal way less fancy than the fancy blenders kind of blender, I’ve found this order of ingredients blends the best. Putting the banana on bottom followed by the liquids and remaining ingredients seems helps it get going and blended smoothly. This makes a large serving, about 30 ounces. I drink the whole thing and just that (with protein powder added like I said previously, which is a total of 350 calories) for breakfast (or lunch if a detox week). If you need to not just drink your breakfast, you could split this with your housemates. I love chai. I love it so so much. I call it Christmas in a cup. I love it hot. I love it iced. I love it blended. I love it mixed with pumpkin spice. I LOVE IT! 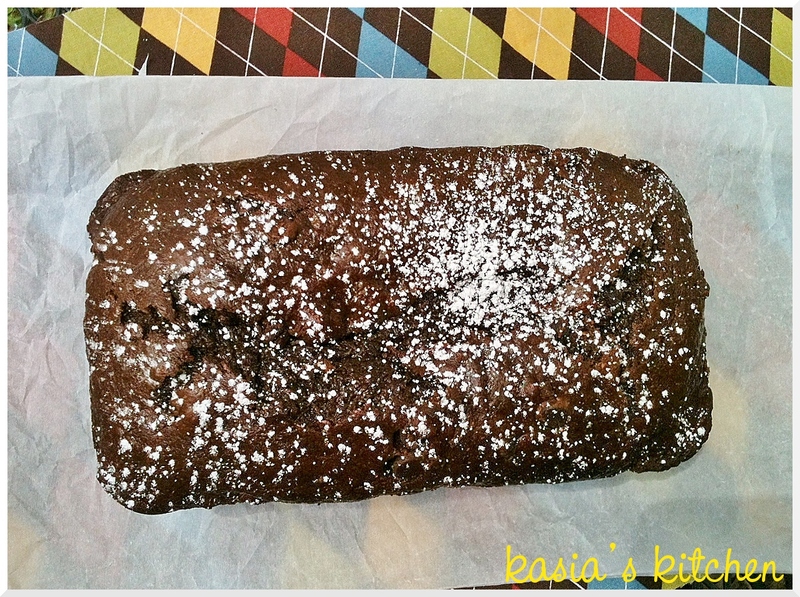 When I saw a Chai Banana Bread recipe, I instantly added it to my list of things to make. However… I’m calling mine Chai Inspired. The original recipe calls for cardamom, which is a chai ingredient, but dang it that stuff is expensive! My bananas were getting too brown before I could justify buying cardamon, so I improvised and they still taste spicy and yummy! 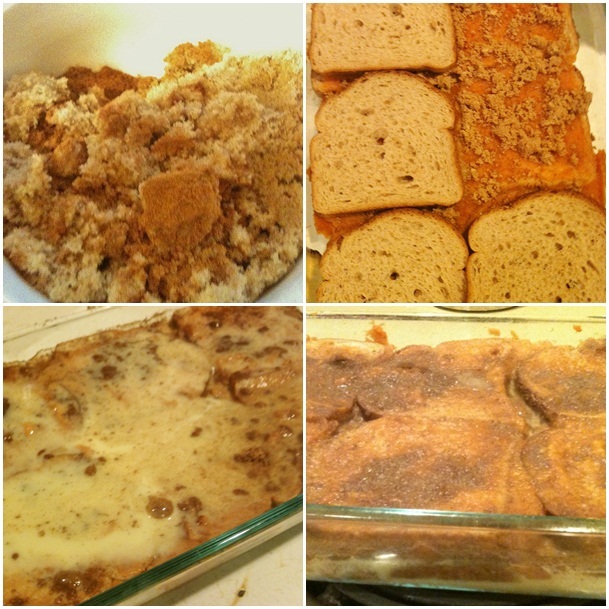 I pretty much used her recipe but did a few healthy substitutes using yogurt butter, applesauce and whole wheat flour. I also made have jumbo muffins to break in my jumbo tin I hadn’t used yet and half regular sized. I enjoyed these for breakfast, snack and dessert all week. Or for three days because I ate them too quickly. Original Recipe from Cinnamon Spice and Everything Nice. Preheat oven to 350 degrees. Add banana, yogurt, apple sauce, butter and egg beaters to a mixing bowl and beat until blended. I used, as always, my stand mixer. Add brown sugar and white sugar and beat on medium until just blended. In a separate bowl mix flour, baking soda, salt, cinnamon, ginger, pumpkin pie spice, and nutmeg together. Add dry mixture a little bit at a time to the banana mixture and beat until just combined. Don’t over mix! Pour into lined muffin tins and bake for 45-60 minutes, checking often to see if a toothpick comes out clean. Cool on a wire rack in pan for 10 minutes. Remove from pan and cool completely before frosting. 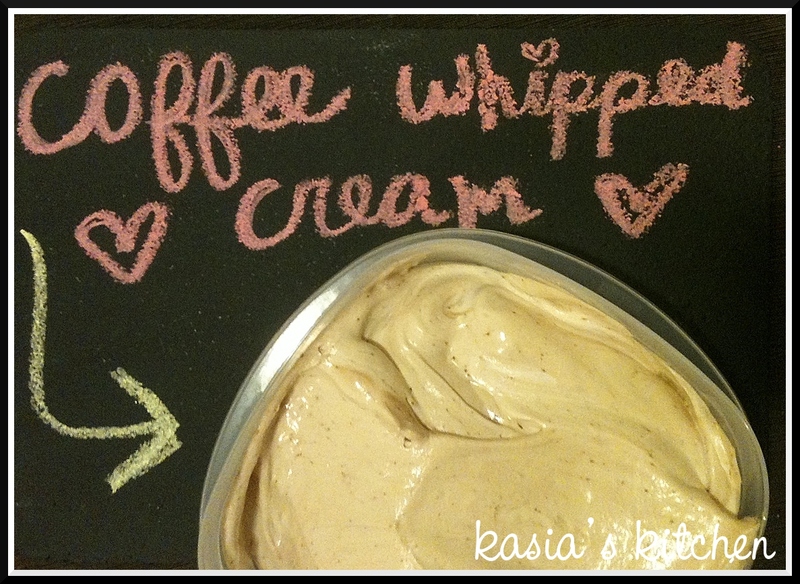 For icing, beat butter and cream cheese together with a mixer until smooth. Add vanilla extract and beat. With mixer on low add the powdered sugar a little at a time until thick enough to spread. 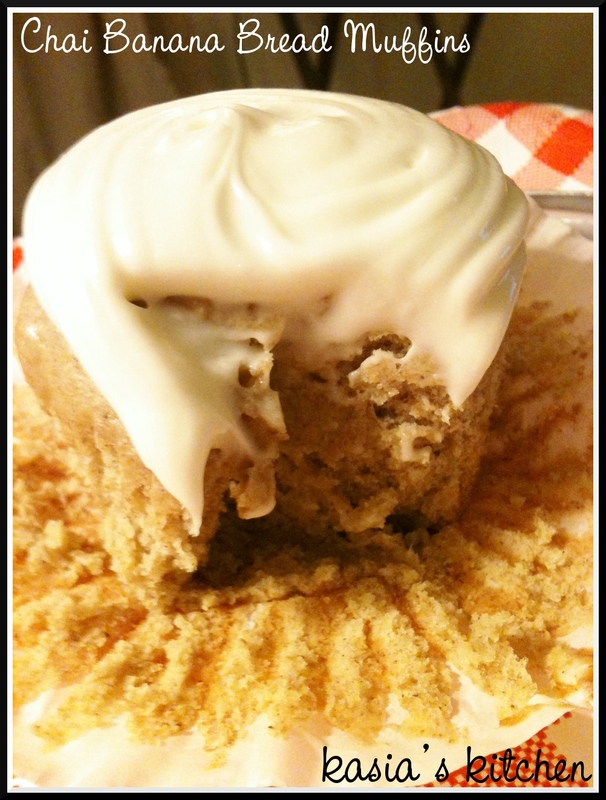 Top muffins with icing and enjoy! I also froze a few of mine because I was going out of town and they defrosted well too! Moving on… I don’t have to tell you again how much I love pumpkin things. 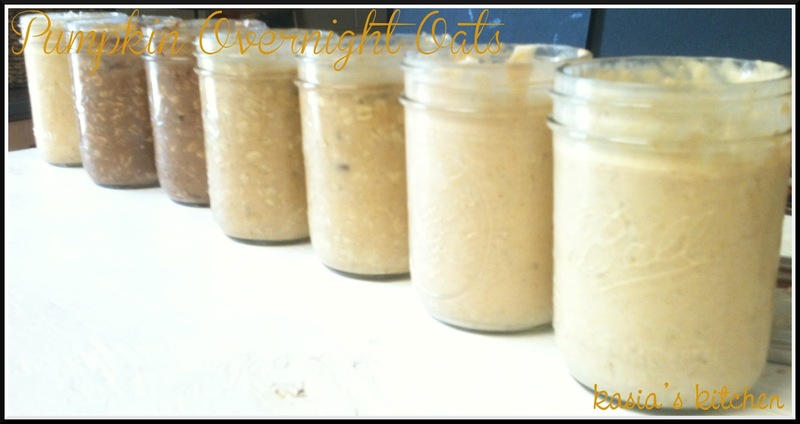 I probably also don’t have to tell you again how much I love Overnight Oats. We’ve definitely discussed the heck out of pumpkin, and I know I’ve discussed Overnight Oats a bit too. 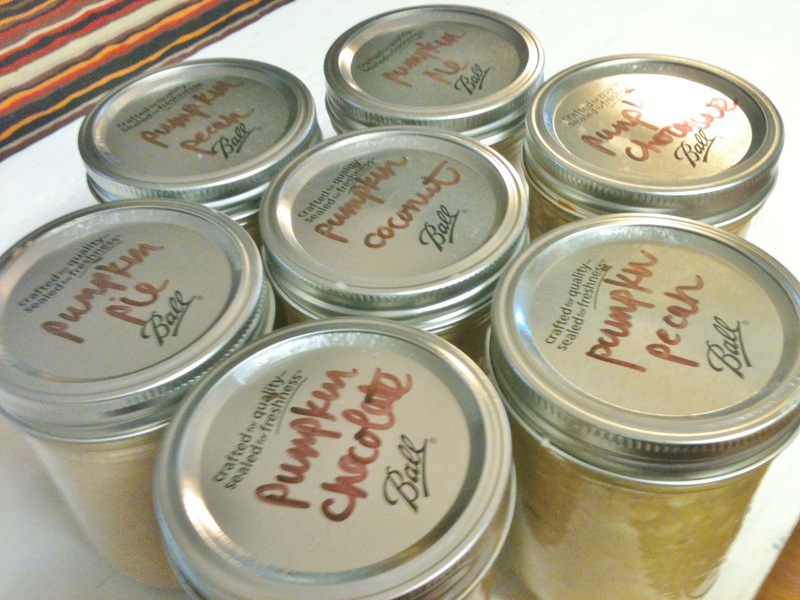 BUT… PUMPKIN OVERNIGHT OATS?! Yep. I’m even more in love. 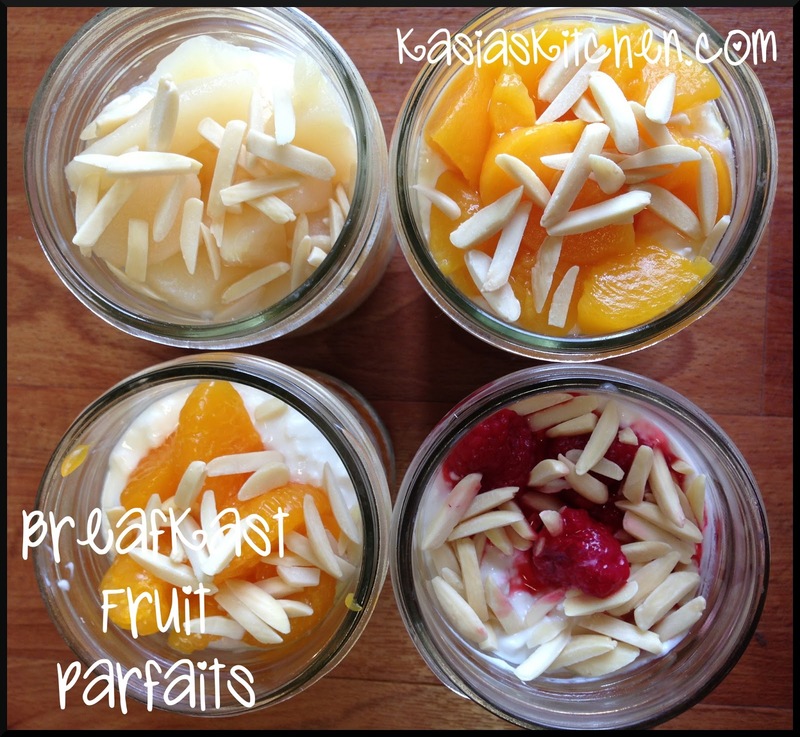 I went a little crazy and came up with four pumpkin versions of this easy make ahead breakfast. I used my base recipe for each of these concoctions. 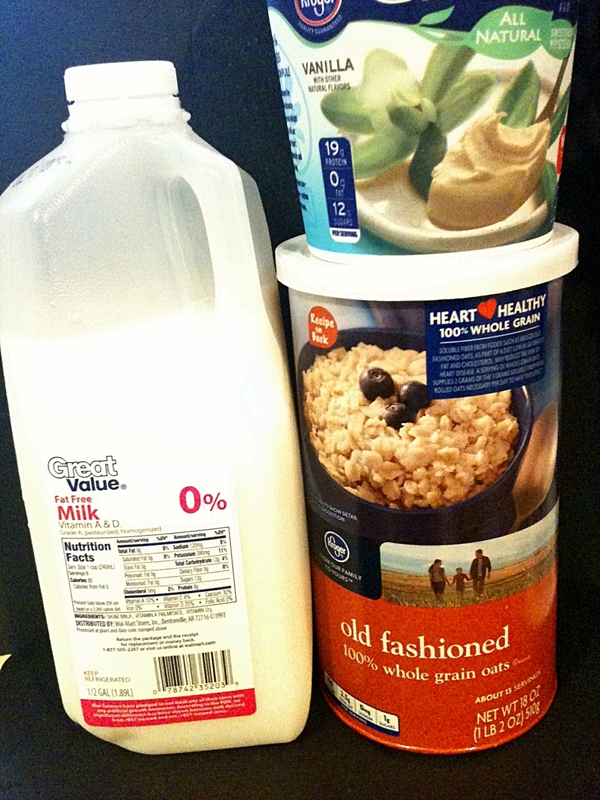 1/2 cup oats (non quick cooking), 1/2 cup skim milk, 1/2 cup nonfat vanilla yogurt (greek or regular). I bought the 32 ounce container of Dannon Light and Fit from Sam’s this time. It was super cheap for the big container, and I think I liked it a little better than the vanilla greek non fat yogurt. 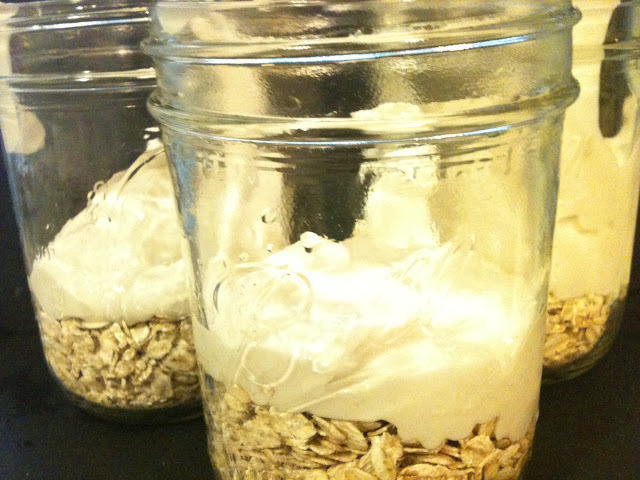 Pour yogurt, oats and milk in a pint sized mason jar. Shake it until all ingredients are combined. At this point your jar will be about 3/4ths full. Add pumpkin combo ingredients (listed below) of choice and stir until combined. Refrigerate overnight. They keep for 4 days. 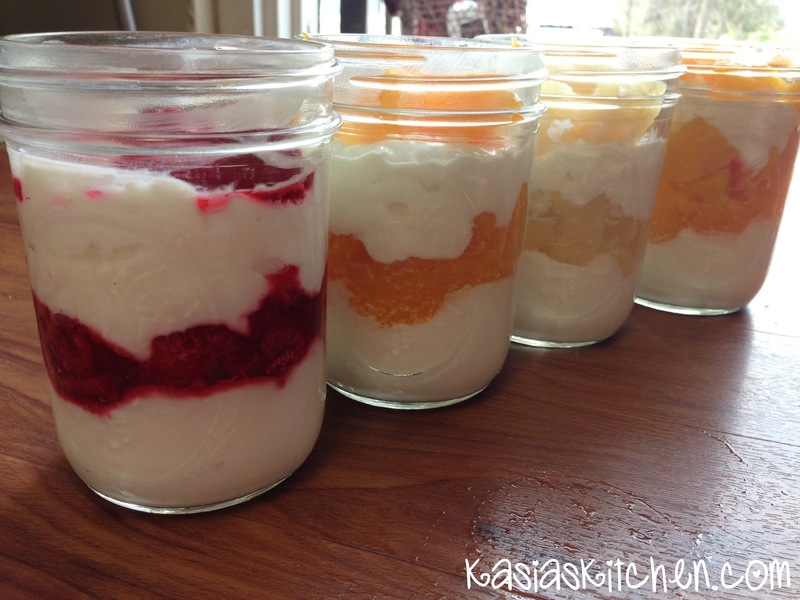 Each base recipe is 7 points on Weight Watchers. Account for extra points for the different pumpkiny combinations. You know how I have all those weird seasonal food aversions? No soup, grilled cheese sandwiches, or hot coffee unless it’s cold out. No watermelon, or any melons for that matter, unless it’s hot out. I also kind of feel this way about oatmeal. I LOVE a bowl of warm cozy oatmeal in the fall and winter, but I’m not a huge fan in the summer. 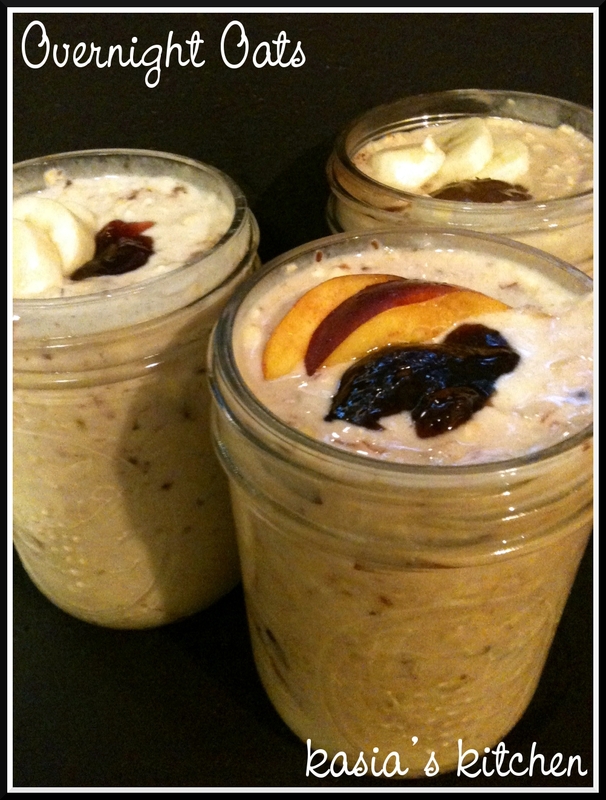 I kept seeing cold overnight oatmeal on Pinterest. I didn’t buy into it at first because I thought the texture might be weird and most recipes called for chia seeds, which freaked me out a little. Chia pets. Chair seeds. They are the same things. I’m not a picky eater, but that made me hesitant. Since then I’ve discovered it’s normal and okay to eat chia seeds. I’m not scared of them, but still haven’t tried them. Apparently they are really good for pregnant women. One day when/if I get pregnant, I’ll add chia seeds to my oats. For now I’ll save my self a trip to a health food store. All that to say, try these! You don’t have to have the fancy chia seeds. My pregnant friend made them first (with chia seeds) and highly recommended them to me. We have similar food likes, so I trusted her recommendation. I’m in love! I got obsessed and game up with EIGHT flavor combinations. I’m gonna work on a pumpkin version next week. This is one thing that will not be a seasonal food. I love them for summer to take the place of hot oatmeal, but I love them so much I will definitely eat them year round. Add your toppings of choice, and shake until mixed. You may have to shake a little extra for some toppings. If it’s not combining well, stir in the toppings to combine all ingredients. Refrigerate overnight. I made four at once and they were good up to 4 days. 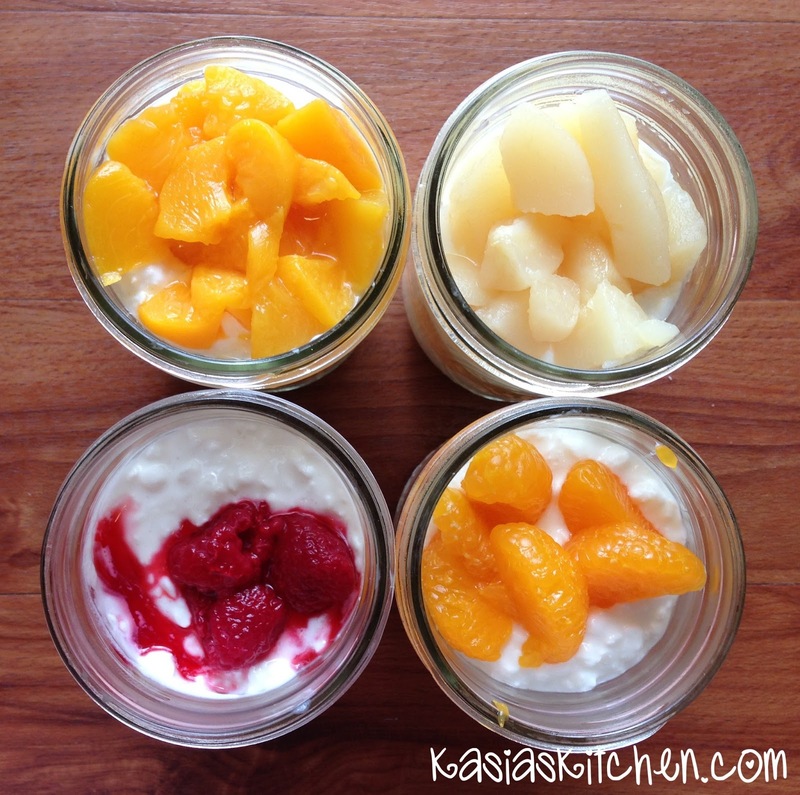 I don’t think I’d go more than 4 or 5 days because fruit and non-fat yogurt can produce excess water. For pretty presentation you can save out tiny bits of your toppings to garnish the tops. 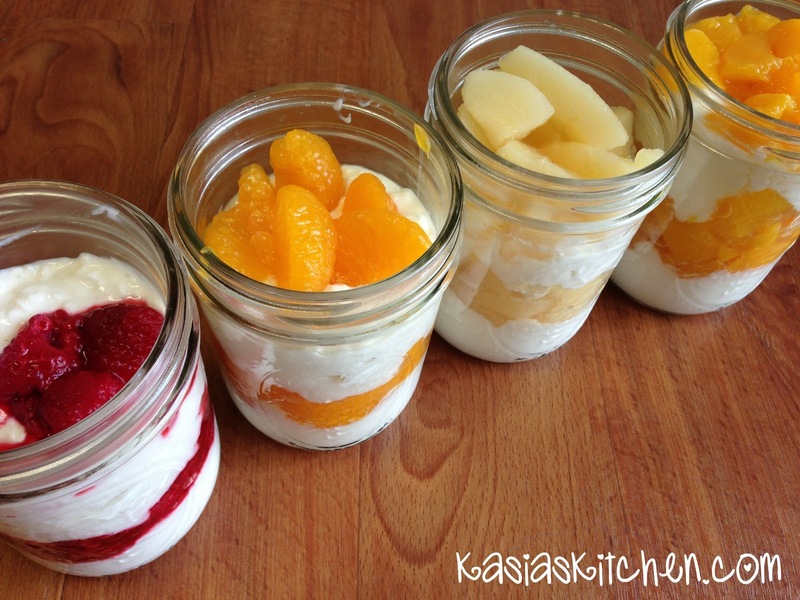 Each base recipe is 7 points on Weight Watchers. Extra points for different topping combinations are listed below. Add 2 points for jam. Add 1 point for honey. Add 3 points for Nutella. Add 2 points for 1 tablespoon of peanut butter + 1/2 teaspoon of honey. No extra points! 1 tablespoon of cocoa powder is zero. According to recipe builder you’d count the points for bananas in recipes, but I say if they’re free as a snack they are free as a topping! Add 2 points for honey and how every many points for the nuts you choose. Saute diced apple with a little Parkay spray butter, cinnamon, and brown sugar until they loose a tiny bit of their crispness. Add 1 point for brown sugar. Stir into base recipe. Shake to combine completely. We all deal with stress differently. Some people sleep. Some exercise. Some avoid. You’ve heard of stress eating right? Well I stress bake. Stress baking is almost as bad for you as stress eating when no RAs are around to feed your baking projects to! 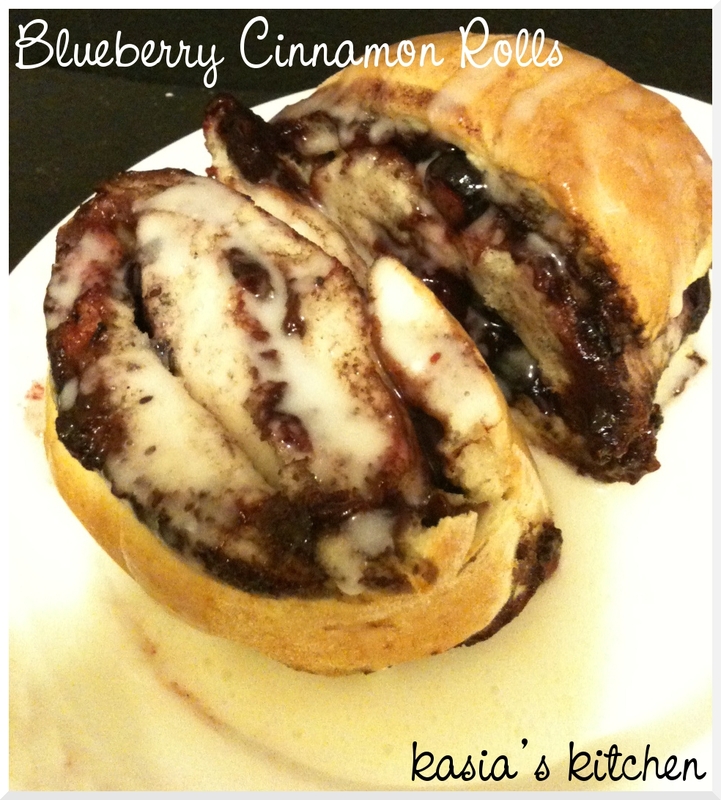 Remember that time I ate four blueberry cinnamon rolls for dinner and just that? Oops. I’m gonna need to move back into my apartment soon and have access to my craft box for other means of stress relief! But seriously, if anything stuck with me from counseling it was the bit about doing mastery and pleasure activities in times of overwhelming sadness or anxiety. Translation… doing things you know you can master, finish and accomplish well and things that bring your soul pleasure. Knowing this is going to help me make it through the difficult times that lie ahead with my dad’s health. Baking definitely meets both of those needs for me. I wish you could have seen my face when I opened the oven to the beautiful creation above. On second thought… I’m kind of glad you couldn’t see me. I’m certain I looked like a super dork. But I was ecstatic! I had been crying for hours, got up, baked, and pulled that out of the oven! I was so happy and proud of my creation. I think I may have even bounced on my heels a little. I’m claiming this recipe as my own because it really was mostly me. The cinnamon roll recipe was from food.com, but I altered it to be a healthier version using egg beaters, heart healthy mix, and low calorie butter. 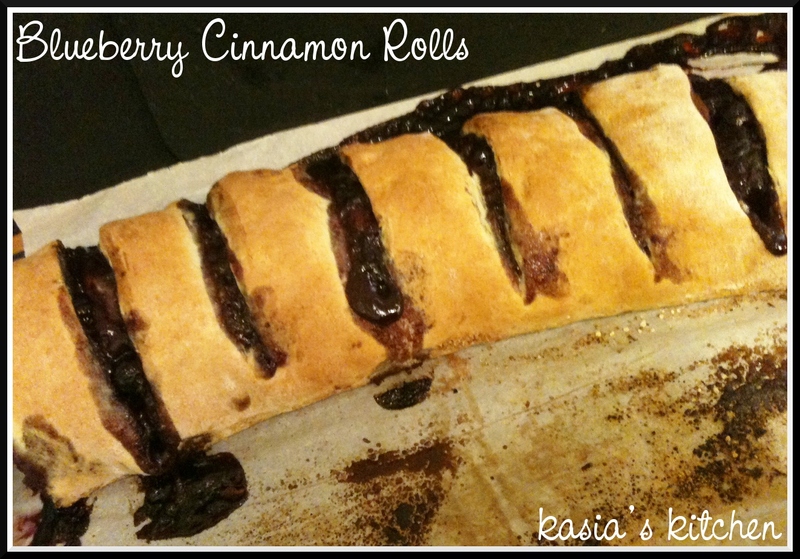 The blueberry part was inspired by recipes I’ve seen but my combination of ingredients. The glaze was thrown together by me. Preheat oven to 375. Mix baking mix, milk, and egg until a soft dough forms, I used my stand mixer dough hook for the first time! Place dough ball onto lightly floured parchment paper or a lightly floured clean surface. I’m OCD about germs so I always use parchment or wax paper to do dough work. Gently kneed the dough until mostly smooth. Roll dough into a 8 x 10 (ish) rectangle. If your dough is looking more round and not square enough, fold in the ends and keep rolling. Combine cinnamon and the 1/4 cup of sugar. Sprinkle cinnamon and sugar mixture over buttered dough. Combine 1 cup blueberries, sugar, cornstarch, lemon juice and water in a small saucepan. Cook on medium low heat until blueberries start to burst. I used a potato smasher to break mine down a bit more and thicken the sauce. When the sauce is a good consistency remove from heat and allow to cool slightly. 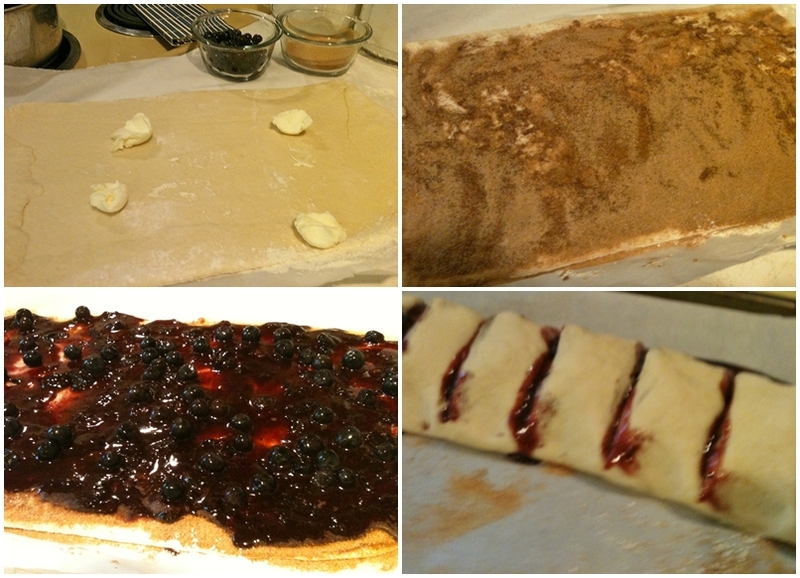 Spread the blueberry sauce on top of the cinnamon and butter topped dough. Sprinkle additional 1/2 cup of blueberries. Roll up tightly starting with the long side. Pinch the edges of the dough closed. Place on a parchment lined baking sheet. Cut 3/4 to 1 inch slits going almost through the bottom using a sharp knife. Don’t go all the way to the bottom! It should make 8 rolls, 10 smaller ones. Bake for about 20 minutes or until light golden brown. Mix cream cheese, powdered sugar, lemon juice, and a splash of milk in a small bowl or a large measuring cup and stir! I used my immersion blender and it made it a quick and easy job. Just look at it! They are so very good and just pretty! 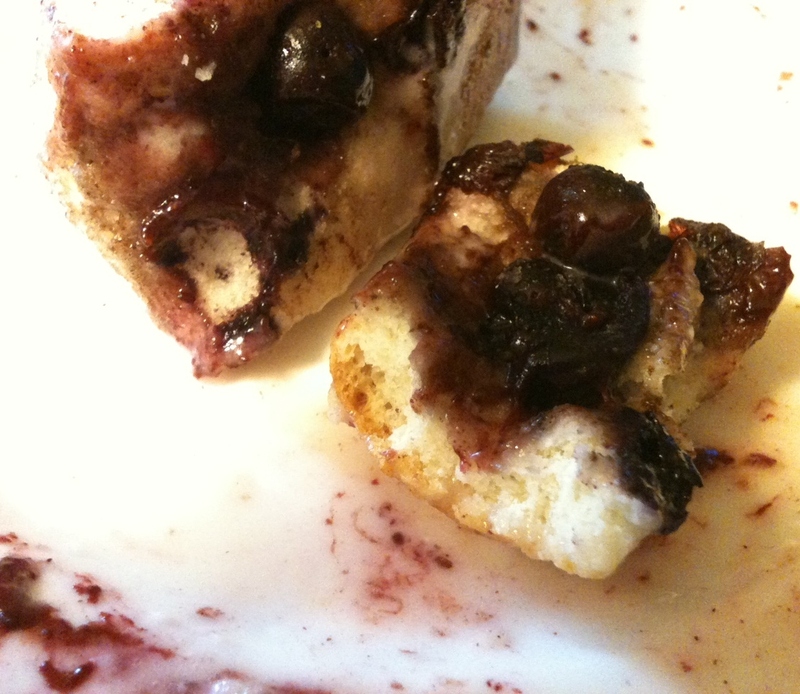 In the words of a coworker I shared one of these cinnamon rolls with, “These things are gourmet!” Easy and impressive. You can never have enough recipes like that. I’m not suggesting that these as “healthy” BUT they are a much healthier version of most cinnamon desserts and cinnamon rolls. 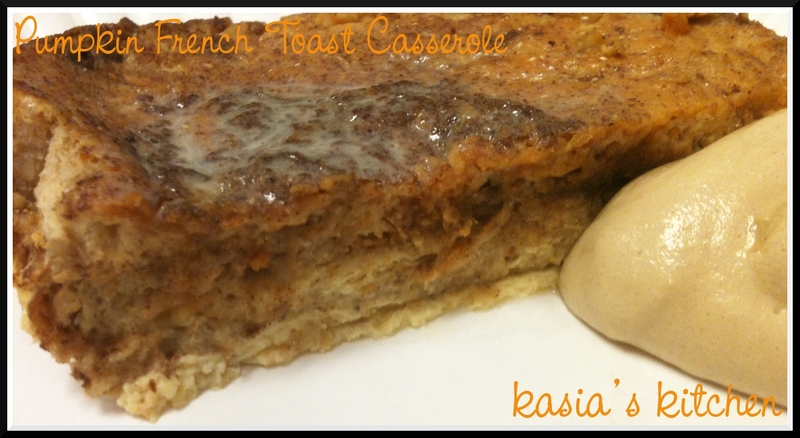 According to the Weight Watcher’s Recipe Builder they are 7 points with the glaze. For comparison, a Starbucks Morning Bun (their cinnamon roll) is 10 points with no icing or glaze. A Corner Bakery Cinnamon Roll is 17 points! A Pillsbury Supreme Cinnamon Rolls is 10 points. 7 doesn’t seem bad at all in comparison! Once upon a time, I didn’t eat breakfast very often. I was either too rushed, not hungry, woke up too late or just (let’s be honest) too lazy. However, as a Weight Watchers doer and meeting attender I quickly learned breakfast is essential! Fact – people who eat breakfast loose more weight and are just generally healthier. As you should know by now, breakfast has become one of my favorites! I mean I can’t ever get enough of these make ahead crustless breakfast quiches, I’ve posted them twice with different variations and made them WAY more than twice. There were the make ahead breakfast burritos and banana pancake muffins. 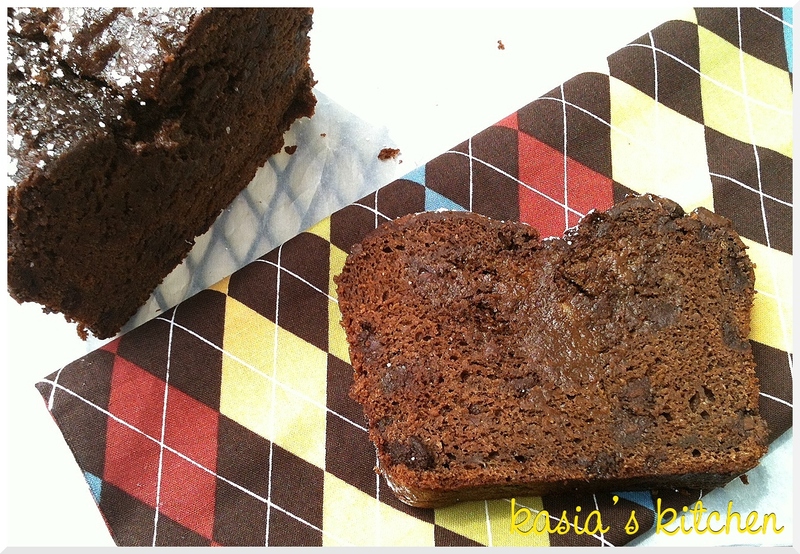 And now… CHOCOLATE! Is there anything better for breakfast than chocolate? I mean it’s bread. Bread is a breakfast food. It has bananas. That’s fruit. 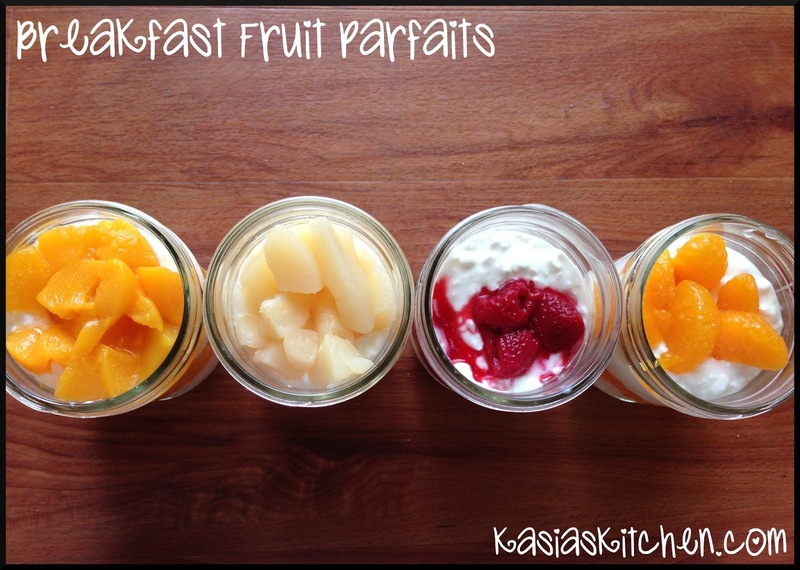 Fruit is a breakfast food. 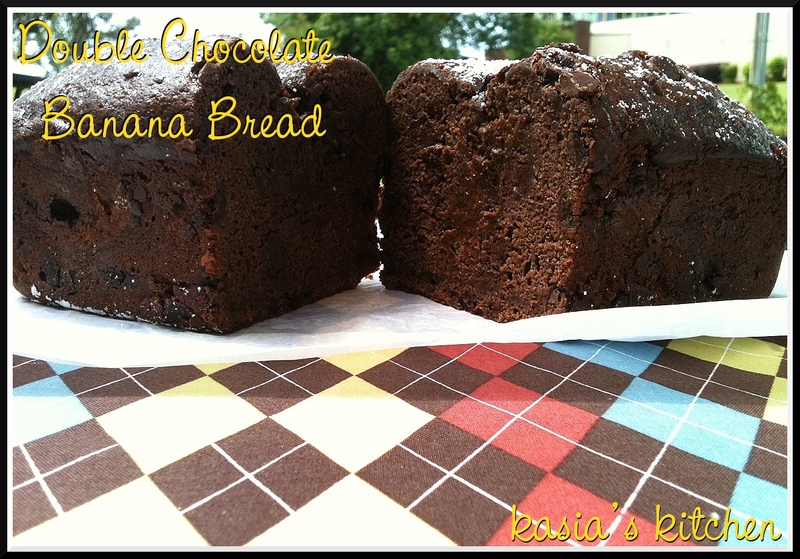 So Double Chocolate Banana Bread can most definitely be eaten for breakfast right?! Glad you agree. Recipe yields 2 loaves of bread, 12 slices each loaf, 24 servings, 6 Weight Watchers points per whole slice, 3 per half slices (which is a great snack size). 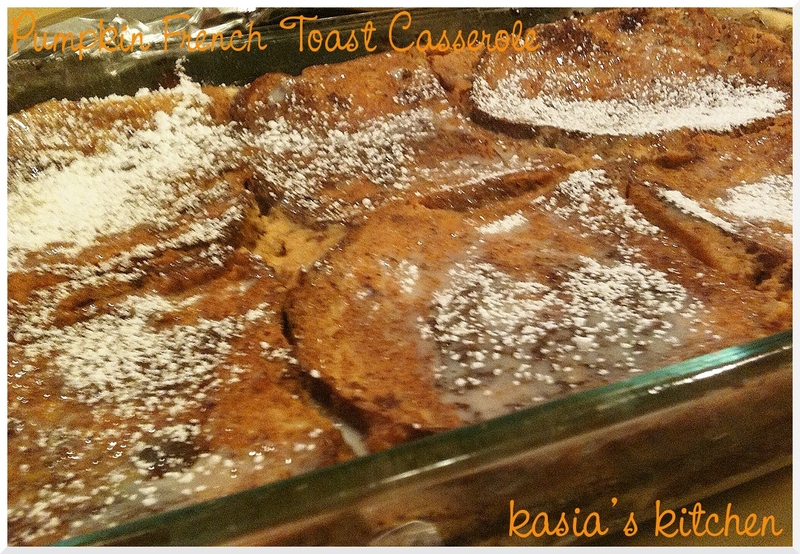 Calculated using the Recipe Builder on Weight Watcher Etools. Preheat oven to 350. Spray the bottom of an 8×4 inch loaf pan with cooking spray. I only had one, so I did it in two batches. If you have two, even better! Beat sugar, egg beaters, and applesauce on medium speed until combined. Beat in mashed bananas and vanilla on low. Combine flours, cocoa, baking soda and salt in a seperate bowl. Beat into banana mixture one cup sized scoop at a time on low speed until combined. Stir in chocolate chips. Pour half of the batter into loaf pan(s). Bake 60-65 minutes or until center of bread doesn’t jiggle. Cool 10 minutes. Turn out of pan unto a wire cooling rack and cool completely. Sprinkle top with powdered sugar to pretty it up a little. This recipe can easily be halved if you only want one loaf. But I’m telling you, it’s so good you’re going to want to share! Which means, one loaf for you and one for sharing. Trust me, you’re not going to want to share your loaf. How do you like your breakfast? Sweet or savory? We established during our BLT discussion that my brain and taste buds have their own strange set of odd rules (no soup and grilled cheese unless it’s cold outside, BLTs and melons are only for Spring and Summer, etc.). I discovered two new ones. Apparently I don’t feel like crafting unless it’s Fall/Winter. I’ve totally failed at keeping DIY Club going this Spring. I also made up a rule somewhere along the way that I’m not allowed to wear red on Easter Sunday. I have this really cute wrap dress I’d like to wear as my Easter dress this year, but I’ve been having this internal battle that I can’t wear it because it’s in the red family. It’s one of the Spring pop colors apparently, the tomato tangerine red orange color, and I love it! Where the heck did I get this concept from?! I have a feeling it’s somehow to be blamed on my Southern roots and upbringing. Maybe I just associated the numerous pastel Easter dresses I had growing up with being the opposite of red. Who knows. Regardless, I’m forcing my brain to get over it and wearing the dress. I might even try to make a soup between now and September. However, there is one weird quirk I’m not willing to let go of and fully embrace. I can’t drink hot beverages from mid February to mid September (which is pretty much the Mississippi version of Summer). However, I love and must have coffee! Financially, I can not rely on my Starbucks Batista to provide my coffee for me every day. I’ve experimented with making my own iced coffee for several years. A fellow food blogging friend led me to a great way to make coffee concentrate for iced coffee last year. I liked that a lot, but it does take some effort and time. I also experimented with low cal frappes using instant coffee last summer. But I finally concocted the perfect (for me) iced coffee. It uses Starbucks Via Iced Coffee packets. Depending on where you get them, they can be on the pricey side. They are more expensive at Starbucks, but you can get them at Kroger and Walmart as well. I happened upon them at Sam’s for a really great deal! Normally one box of five packets is close to $5. Last summer at Sam’s they sold them in two box packs (10 packets) for $2.81! I loaded up! I’m still using my stash from last summer. Unfortunately they aren’t selling them at Sam’s right now (I called), but sometimes things are seasonal there so I’m hoping they will bring them back for the summer. I like using these because they dissolve in cold water. Regular instant coffee has to be dissolved in hot water first. I use my cute little 2 quart jug from Target. You could use any container you have. Pour the Via packets in your container of choice. Add creamer and 1 cup of milk. Shake shake shake. Shake until the Via dissolves or almost is completely dissolved. Add remaining milk. Add water one cup at a time. Via is strong just like Starbucks brewed coffee. I’m not a fan of uber strong coffee. So this combination is perfect for me. Each packet calls for 16 oz of liquid. I double that amount and it’s a perfect strength and taste for me. Tastes similar to the strength of McDonald’s iced coffee or has a similar strength of a Starbucks frappuccino vs. the brew. Once you get all the liquid in, you may be able to shake it a little, but I advise stirring. And then… I made something unhealthy(ish), but I highly recommend that you make this one a day when you are having a cheat day. The pictures are awful! It was dark, daylight pictures are better. Some day soon (very soon) I’ll be making these again, making them healthier, calculating the points, and taking better pictures. I lightened up the original recipe a little, but one of my RAs assisted me and brought out the real butter. 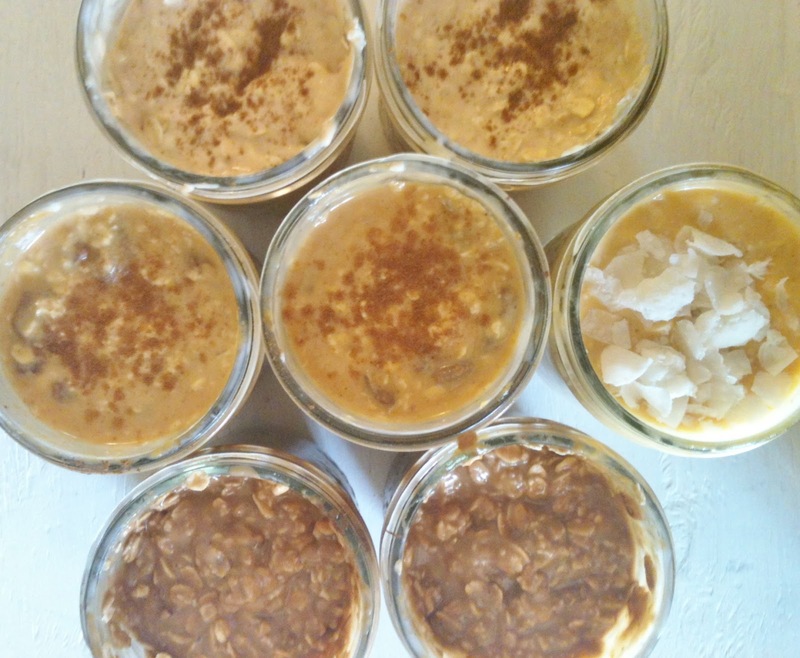 I used fat free sweet condensed milk instead of regular. There’s no turning back when that happens. I made biscuit dough from Heart Healthy Bisquick instead of using regular canned biscuits. Next time I’ll also use Brummel and Brown yogurt butter. Inspired by Pioneer Woman’s recipe. Preheat oven to 375. Mix Bisquick and milk until combined. Place dough on a floured surface and knead, folding over and over about 10 times. Spray your muffin tin. Add a little pad of butter, about 1/2 tsp, in each muffin cup. Sprinkle cinnamon and sugar on top of each. Pull walnut sized balls of dough off and roll in the palms of your hands. Place three dough balls in each muffin cup. Add another little pad of butter, about 1/2 tsp, on top of each. Sprinkle each with cinnamon and sugar. Bake for 15 minutes or until golden brown. Immediately drizzle LOTS of condensed milk on top. Let soak in for 1 minute. Spoon out and enjoy!